The Harvard Clean Energy project, lead by CCH editor Alán Aspuru-Guzik, has released the results of 150,000,000 DFT calculations on 2,300,000 compounds under the CC-BY license at www.molecularspace.org. The details of the calculations has been described in a 2011 Journal of Physical Chemistry Letters paper and will be described further in an upcoming paper. The compounds in the database were selected as potential candidates for organic photovoltaics and the database contains HOMO and LUMO orbitals energies, and their difference, computed using various DFT functionals, which, in turn are used to estimate power conversion efficiency, the open circuit voltage, and the short-circuit current density using the standard Scharber model. The HOMO and LUMO energies and gaps represent averages of several DFT methods and conformations and are calibrated against experimental data. Details of this calibration are not given the 2011 JCP Letters paper, so they may appear in the forthcoming paper. According to the website, molecularspace.org will soon be augmented by a designer module that "will allow you to help us design new materials. By following simple chemical rules and using our predictive model, you can help us develop new candidates for solar cell materials." The calculations were made possible by using the World Community Grid managed by IBM. (3) Danovich, D.; Shaik, S.; Rzepa, H. S.; Hoffmann, R. "A Response to the Critical Comments on “One Molecule, Two Atoms, Three Views, Four Bonds?”," Angew. Chem. Int. Ed. 2013, 52, 5926-5928, DOI:10.1002/anie.201302350. The transformation is simple, but the catalyst, L-Asparaginase II, is not. The active site of the enzyme contains a number of functional groups which work together to hydrolyse the enzyme. The currently accepted mechanism is that the process is related to that of a serine protease, with Thr12 attacking the amide to form an ester that is then hydrolysed. This mechanism looks reasonable. The three-dimensional structure shows that Thr12 is poised over the carbonyl of the amide, close to the π* orbital of the carbonyl and in about the right position to attack. However, studies of mutants of the enzyme do not provide unambiguous support for this proposal. This paper reports a computational study of the system using an ONIOM approach, with B3LYP/6-31G(d) for the high-level layer and AM1 for the low-level layer. 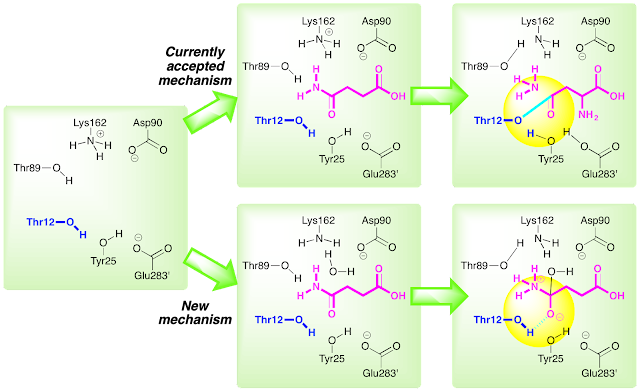 This split approach made it possible to follow the reaction pathways for the system. Minima and transition states were recalculated using single point calculations at the M06-2X/6-311++G(2d,2p) level. 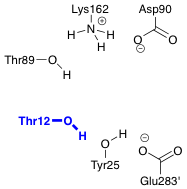 This method showed that the currently accepted mechanism, summarized in the figure below showing the key Thr12-substrate interaction in cyan, was a high energy pathway, and an alternative mechanism involving the attack of a water molecule and stabilization of the intermediate oxyanion by Thr12 was more accessible. The new mechanism is surprising in that Thr12 is above the carbonyl group and so not in a good position to interact with the lone pair of the amide carbonyl. However, this configuration does fit the grand jeté orientation that we recently highlighted for mechanisms involving oxyanion holes (doi: 10.1039/C2OB06717J). This paper demonstrates that the calculations can provide a sufficiently accurate analysis of the system to inspire an alternative to the currently accepted mechanism. The new mechanism fits all of the available experimental data; it was hard to see how some of the experimental data fitted the original mechanism. The new mechanism, therefore, is to be preferred. If both mechanisms had fitted the available experimental data, would these demanding calculations have been enough to change the currently accepted mechanism to the new process?